The Atlanta Falcons have started their offseason conditioning program without wide receiver Julio Jones for the second straight year. Defensive tackle Grady Jarrett also did not attend the launch of the offseason program, which started Monday and continued Wednesday. The Falcons placed a $15.209 million franchise tag on Jarrett and hope to negotiate a new long-term deal with the leader of the team&apos;s defensive front. For the second consecutive year, the Saints and Falcons will meet on Thanksgiving night. Last year they played in New Orleans, and this year they&apos;re playing in Atlanta, according to multiple reports. The Thanksgiving night game is always on NBC, after the early game in Detroit and the late afternoon game in Dallas. According to the Philadelphia Inquirer&apos;s Jeff McLane, the Eagles will open their schedule at home against Washington, before heading on the road to take on the Atlanta Falcons in a Sunday Night Football contest on NBC. According to the New York Daily News&apos; Manish Mehta, the Jets will be in town for Week 5. According to TheAthletic&apos;s Jeff Howe, the Patriots will be in town for a 4:25 p.m. kickoff in Week 11. Art Stapleton has the Giants&apos; schedule too, so there&apos;s two more games. The Seattle Seahawks and Russell Wilson agreed to a four-year extension worth a reported $140 million, making the franchise quarterback the highest-paid player in the NFL. The deal, which includes a $65 million signing bonus and no-trade clause, was reached late Monday night. Wilson confirmed the new deal in a Twitter post early Tuesday. The Atlanta Falcons have signed offensive lineman John Wetzel to a one-year contract and defensive end Chris Odom to a two-year deal. Wetzel played in 40 games, including 24 starts, with the Arizona Cardinals over the last three seasons. The 6-foot-7, 328-pounder can play both tackle and guard, adding depth to a revamped unit up front. Atlanta Falcons wide receiver Julio Jones is in search of a new contract, so he will take the “optional” in “optional team activities” literally. The six-time Pro Bowler was not at the first day of OTAs on Monday, according to a report from ESPN, although the team is not concerned because he is expected to rejoin the team for mandatory workouts in June. Jones did not show up for last year&apos;s optional workouts as well because he thought he was worth more than he was scheduled to make. 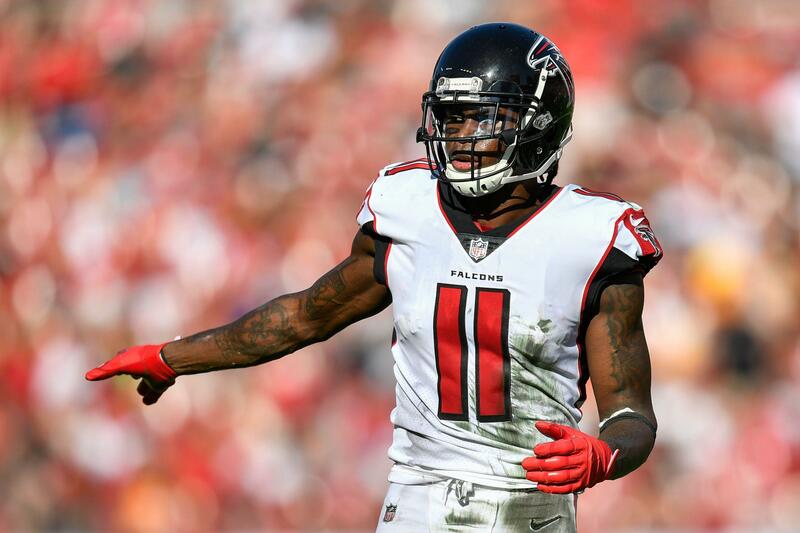 Posted in Atlanta Falcons | Comments Off on Julio Jones got a new contract last time he skipped OTAs, but will it work this time? The Atlanta Falcons continued to bolster their defensive line by agreeing to terms on a one-year contract with tackle Tyeler Davison. Davison started 12 of 14 games with the New Orleans Saints last season and had two sacks with 23 tackles. The addition Saturday comes after the Falcons signed defensive end Adrian Clayborn to a one-year deal Tuesday.